So three years later, we're hearing rumbling on the next Ys game. This one looks to be taking a trip to not-France. Obligatory bring back xseed post. BUT WILL THERE BE A SHIPWRECK!?!@?@! Obligatory Adol shipwrecks into the french prison and loses his armor and weapons from 8 then gets arrested post. I still need to beat Ys VII on PC. 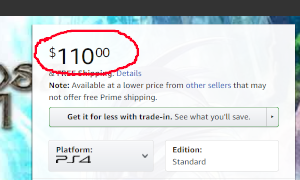 Well, I guess I'll go get Ys VIII in the meantime, now that they've retranslated it (and the Switch port wasn't worth the wait judging from reviews online). It's been long enough, I'm sure it's cheap now, right? I hope Ys IX has less transitions between areas of the map. As much as I loved Lacrimosa of Dana, it did kind of take me out of the experience a bit when Adol's out on that initial southern beach area where everything looks so open, yet each "section" of the beach had to load on its own between black screens instead of just having enemies spawn in as you cross the island. Given that there's no Vita version in the works this time, it should be a bit better about that.